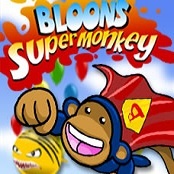 _Take control of Super Monkey as he embarks on a Bloon popping frenzy through 5 stages and 15 waves. Collect and use Power Blops to upgrade Super Monkey in three different skill paths. Watch out for super powerups and make sure you score at least Bronze in each wave to advance to the next. Good luck! _NOW UPDATED WITH NEW THE NEW TOWERS! 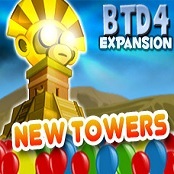 Use your favourite new towers, the Dartling Gun and the Spike Factory in this awesome expansion pack for BTD4. Bloons Tower Defense 4 Expansion contains 4 brand new crazy fun tracks for you to try out. Mesmerise yourself on the Sandy Spiral Track, get lost in the Subterrainian Sewers, explore the secrets of the Monkey Temple, or challenge your wits on the Triangle of Insanity! This expansion also includes a new game mode called Deflation mode. You start Deflation mode with 50,000 money but you never get any more. Finally, we have included Tower Specialties, which you will unlock after completing the new tracks in various difficulty levels. The specialties allow you to customize your strategy by making some towers much cheaper to buy, at the expense of increasing the cost of all others. _New Tower Number 2! We are proud to introduce you to the Spike Factory. This mechanical tower protects your interests by spitting out piles of road spikes onto the track periodically. 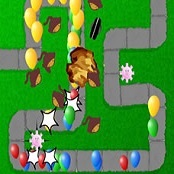 A well placed Spike Factory can build up big piles of spikes each round, ensuring a solid defense against the bloons. Reach rank 34 to unlock its super power - the spectacular and powerful Spike Storm! 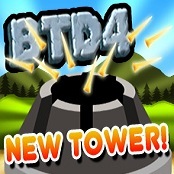 BTD4 features improved graphics, loads of new and original tower types and tons of upgrades for each tower type. Heaps of tracks, save games, career mode, sandbox mode and apopalypse mode. Bloons Tower Defense 4 will give you almost unlimited replay value. Also included is optional MochiCoins premium content featuring lots of extra tracks and special booster upgrades like double boomerangs, exploding darts, and double cash! _It's here. After 319 days, 32 Million plays and countless requests for a sequel to Bloons Tower Defense 2, Ninja Kiwi is proud to present Bloons Tower Defense 3. This time, use the all new towers and upgrades to work your way through 8 all new tracks and 3 difficulty modes to achieve that total Bloon popping satisfaction. Only available on Ninja Kiwi! _Bloons Tower Defense 2 is here! Now with 3 new maps - easy, medium and hard, 1 new tower type, some new upgrades, and brand new on track placeable items, monkey glue, and road spikes. To challenge you there are 2 new bloon types. Have fun passing all 50 levels! 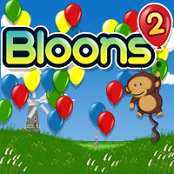 _Stop any bloons from escaping the maze by building and upgrading bloons popping towers. Towers can throw darts, tacks, bombs, and ice. Can you make it through all 50 levels? 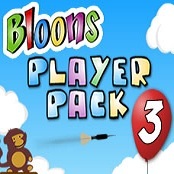 _Move the Bloons around to create a match of three. Plan your moves carefully to create immense combos! _Not for the faint of heart or the unprepared. 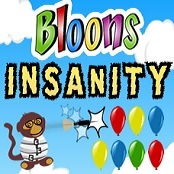 Bloons Insanity is 50 of the most diabolical levels made by our twisted user community! 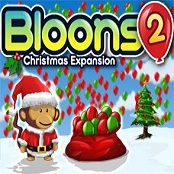 _50 levels of bloons-ey, christmas-ey goodness. Pop your way through a bunch of fun and tricky levels made by you, the players! 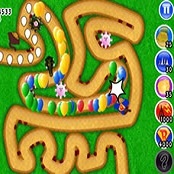 _Play the third player pack of our favourite user made levels from www.bloonsworld.com. Also, be on the look out for a new bloons version coming soon with new bloons and block types! _Here it is! The second pack of our 50 favourite levels from the hundreds of thousands of levels submitted to bloonsworld.com. Like player pack 1, there are some nasty ones in here that might take more than a couple of tries to pass. 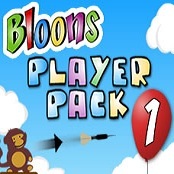 Get your levels in the next player pack - visit www.bloonsworld.com and get creative! 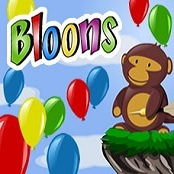 _Play 50 brand new fantastic levels of Bloons created by the fans at Bloonsworld! Some of these are even harder than More Bloons, you have been warned!! 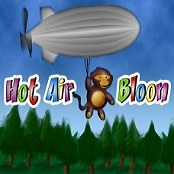 _Play Ninja Kiwi's new Hot Air Bloon game! 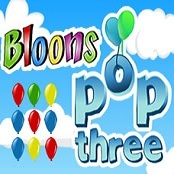 Pop as many bloons as you can without crashing. Try to beat your personal best or set a new high score. 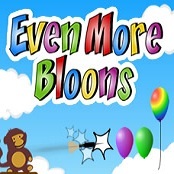 _Play Even More Bloons now! While away the time popping another 50 levels of Ninja Kiwis Bloons game. Enjoy the new helium bloons, as well as the angled rubber blocks for crazy bounce fun! 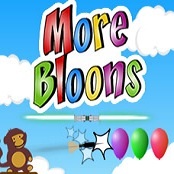 _By popular demand, More Bloons is here. Play 50 all-new challenging levels, and a new special balloon type! Some of these levels are very hard, and should keep most of you busy for a while! _Spring is here! 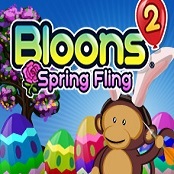 Bloons is back with a basket full of brand new Spring themed levels. Help Monkey find his lounge chair on the beach by getting through all 48 levels - and can you find the 2 secret levels? _Ninja Kiwi brings you a special exclusive pack of Christmas themed Bloons 2 levels. Have a happy and safe Christmas! After more than a BILLION plays of the original Bloons we're proud to bring you the true sequel, the rightful heir, Bloons 2! 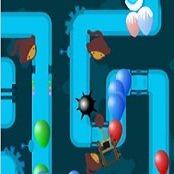 This time, guide your monkey through a world of 8 unique zones totaling 96 levels of Bloons-popping beauty! Prepare yourself for hours of dart-happy play with Bloons 2, the awesomized and updated sequel to one of the most popular web games ever! _Join the millions of other players enjoying Ninja Kiwi's Bloons game. 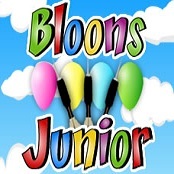 Bloons is based on the very simple fact that popping balloons is fun. Pop your way through all 50 puzzling levels in this exceptionally fun new puzzle adventure! _Bigger darts, slower aiming arrow, 50 brand new easy fun levels suitable for the young or young of heart! Enjoy Ninja Kiwi's Bloons Junior game.